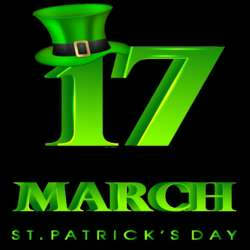 Let`s celebrate together St. Patrick`s Day. Saint Patrick's Day, or the Feast of Saint Patrick (Irish: Lá Fhéile Pádraig, "the Day of the Festival of Patrick"), is a cultural and religious celebration occurring annually on 17 March, the death date of the most commonly-recognised patron saint of Ireland, Saint Patrick (c. AD 385–461). Parade is starting at Protected content Please feel free to bring your irish hat, if you have one.